Welcome to the final days of Cookie Bookie. It's my third year to dedicate an entire week to shivery stories and sugary sweets. Scroll down if you've missed any posts. Don't forget to follow along by clicking on the sidebar in the upper right corner. Today is extra special, since my 9 year old (going on 19) daughter Sailor is guest-posting. I have a cookie to go along with this bookie. I made the cookie all by myself (except for slicing and taking them out of the oven). My mom didn't even know I was baking until she smelled the good smell in the house. I made a peanut butter oatmeal bar, covered with thick dark chocolate to remind me of Blackwood Hall. Then I placed a marshmallow ghost on each square to remind me of the ghosts in the story. I think they are really yummy. You can put chopped peanuts instead of ghosts on top for grown-ups. Preheat oven to 350 degrees. Cream together butter, sugars, vanilla, and peanut butter. Add egg and stir until well blended. Add baking soda, then flour and oatmeal. Pour batter into greased 9 by 13 inch pan. Bake for 15 minutes and remove from oven. Sprinkle with chocolate chips and let stand for five minutes. Spread chocolate over bars. Let cool completely (yah, right!) and cut into squares. Cover with chopped peanuts of a marshmallow ghost. Thanks, Sailor! A plus, kiddo. The best Cookie Bookie for last: the scariest book I've ever read and my new favorite cookie. See you tomorrow. Good job Sailor. You did a great as a guest poster. And you are going to be a wonderful cook just like your Mom. I like the Mary Poppins! I love Nancy Drew,too! Thank goodness she always solves the mystery! Your cookies look very yummy; I like the ghosts on top! I think you should wear both costumes. You could wear one for half of trick or treat and one for the other half. Sailor, if you keep blogging like that you might make your mom feel threatened and then she'll never let you guest blog again. Mary Poppins looks good but I vote for the witch costume. Great post! Thank you for the recipe. I love the Mary Poppins costume. Very well done, Sailor. And your cookies look delicious. I love the marshmallow ghosties on top. I love both costumes but I think that the witch costume will always hold a special place in my heart. =D I love it and both my girls are being witches this year, because we love your costume so much. That is the most adorable witch costume. I like the Mary Poppins costume but I love the witch costume. Maybe you could do two rounds of trick-or-treating...half the town in one costume and the other half in the other costume! Thanks for a great recipe Sailor! The kids will love this cookie with that little ghosty on top.I love both your costumes but my vote goes to the witch costume. It really is the cutest witch costume I've seen. You have a great collection of homemade Halloween Costumes. Thanks for letting Bella Kate borrow Little Bow Peep. It's so cute and she is so happy to get a chance to wear it. Thanks Sailor and a job well done as the guest poster! LOVE the witch costume, glad to see you are feeling better! This is Annabelle. I want you to be to the witch so you match me. I'm going to have a Halloween party at school. It is going to be so much fun. I can't wait until it comes. And I am going to have a Halloween parade at school. I love you. I can't wait to see you for Thanksgiving. Thank you so much. I am trying to be a good cook, just like my mom. That's a really good idea to be both. It's hard because I have to pack them in a suitcase because I'm having Halloween in New York. Jack, Ha ha ha. You crack me up. I really like your witch picture. We have the same tights! I wish I could trick or treat with your family again. I can't wait to see the pictures of little A and A and B-po too. Carrie, That's a good idea. I don't think I can fit both in my suitcase since I'm going to New York for Halloween. Shanzanne, Thanks. I love Mary Poppins ever since I saw the musical in New York. Aunt Mary Kate, I bet Bella will be soooo cute as Bo Peep. I hope that you send us some cute pictures. Thank you! I was sick for a whole week but I finally feel just about all the way better, except for a very very very embarassing runny nose. Annabelle, I love you. I can't wait to see you in your pretty witchy costume. Have fun at your parade. Well done, Sailor! I am partial to Mary Poppins myself. Sailor, you are a great guest blogger! I loved Nancy Drew when I was your age too. Both costumes are beautiful but I really like the Mary Poppins. Oh yeah, I vote the witch again. It is just too adorable not to wear twice! :) I love it! Hi Sailor - oh I remember the days when I used to read Nancy Drew! You did an excellent job with today's post - what a bright and articulate young lady. Both costumes look great but I LOVE the witch costume. It's such a fun costume. LOVED Nancy when I was your age, but my favorites were the girl detectives of the Trixie Belden series! You have very good taste, in books and in costumes, Sailor. I don't know how you're going to decide, but whichever you choose, you'll look FAB! Sailor, we can't wait to see you all in New York. Shelley loves both costumes, but the witch will be a huge hit in New York because here people rarely make their own costumes - it is gorgeous! Hugs to all of you. I don't know how I missed this post yesterday but I did. I didn't even realize you were the guest speaker. 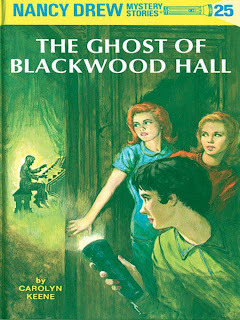 Do you know I have never read a Nancy Drew book, and we had the entire collection. I have read books about the author but never her stories. I think it's because I have always been a big chicken. I loved your costumes. You look so cute and are getting so tall. I hope you have a wonderful time in New York. And your cookies look delicious. Hi Sailor - I love your cookies and hope I can find the marshmallow ghosts to put on top! I read Nancy a lot when I was your age and used to pretend to be "Hank"! My daughter's favorite scary book is "Coraline", but you may want to ask mom about it first before you read it. I vote for the Witch costume because I LOVE IT! Maybe your mom can make me one too! You did a great job at cookie bookie. Both costumes are darling. I like Mary Poppins better and it's more unique. My vote is for the witch costume. I know I am late with my vote - but I think you need more than one Halloween party this year. I love both costumes! Such a creative idea for cookies! I love literature and baking cookies, so I absolutely enjoyed these entries.